Convert audio files to MP3, FLAC, M4A, AAC, Opus, Apple Lossless, Vorbis and many more audio formats. Rip audio CDs in perfect digital quality. Batch convert many audio files at once. Convert audio from 50+ file formats. Burn audio CDs. Batch convert audio files between all audio file formats with the high accuracy 64-bit precision audio converter. Audio file converter can convert up to 64 audio files in parallel for the maximum performance on multi-core processors. Edit metadata of the files and preserve all metadata on file conversions. Secure CD converter rips CDs to MP3, and other audio file formats with advanced error detection and two-pass CRC verification for the bit perfect audio quality. Audio CD Ripper reports all possible CD ripping errors with exact track time information. Download high quality metadata and cover art from GD3, WMP, MusicBrainz, Discogs, Amazon, and Freedb metadata services. EZ CD Audio Converter includes the latest versions of the best audio codecs. Immediately start MP3 Converter, Convert WAV to MP3, FLAC, M4A to MP3, AAC, Opus, WAV, OGG, and all other audio file formats without the hassle of downloading additional software. 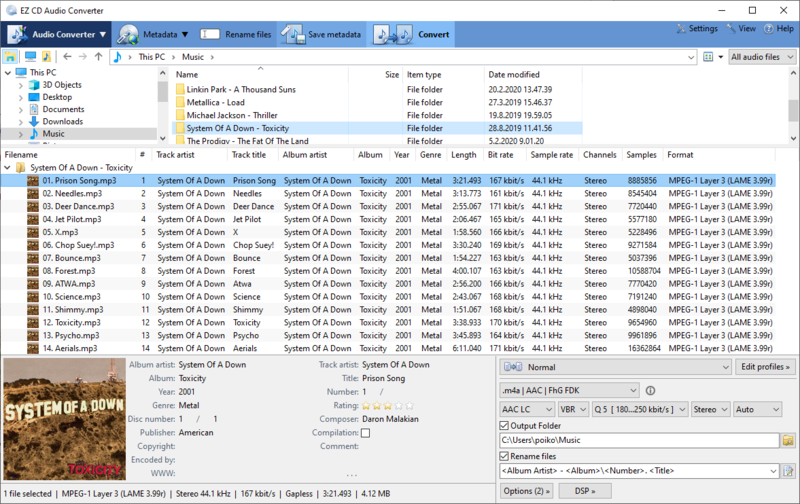 Manage your music collection with the explorer style music file browser. Edit metadata of audio files. Perfect the audio files with high quality metadata and cover art. Batch edit multiple audio files at once. Audio is processed with 64-bit float accuracy. Supports accurate EBU R128 volume normalization and ReplayGain calculation algorithm. Uses SoX Sample Rate Converter for absolutely the best audio quality when sample rate conversion is required. Supports high quality dithering when reducing the bit depth of the audio. CD ripper's error detection mode uses CD/DVD/BD drive hardware features (C2 error pointers, Accurate CDDA stream, status codes) for fast and accurate error detection. And for extra security, the two-pass audio verification can be enabled. Two-pass audio verification reads every track twice and performs sector-by-sector CRC comparison to detect audio errors. EZ CD Audio Converter uses the best available versions of the best audio codecs. Audio conversion is always performed with the maximum resolution supported by the codec. All decoders and encoders, including Opus and MP3 always use the SoX resampler for best audio quality whenever sample rate conversion is needed. It is safe to say, no other audio software converts more multi-format audio files than Poikosoft EZ CD Audio Converter. Over 20+ years we have been perfecting format-compatibility, audio quality, and conversion stability. If converting FLAC to mp3, M4A to mp3, or WAV to mp3, EZ CD Audio Converter is the best, reliable choice. 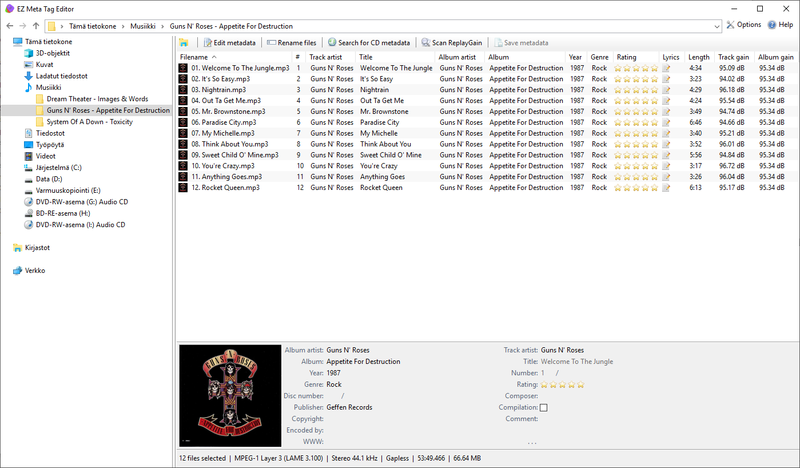 17 April 2019 | EZ CD Audio Converter 8.3 released ! 17 April 2019 | EZ Meta Tag Editor 1.1 released ! 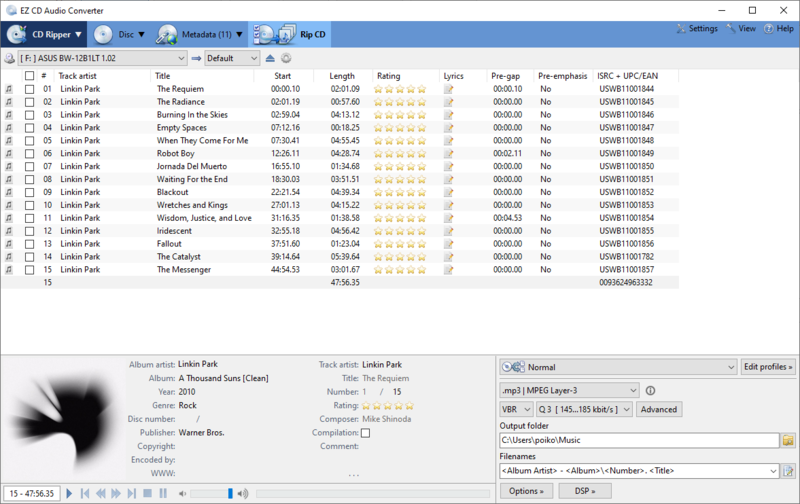 Poikosoft released first MP3 converter and CD ripper in 1997. Audio conversions perfected ever since with over 100 million downloads.